Click Here to download PDF of announcement. The Ohio Soybean Council (OSC) has licensed EnzoMeal®, an advanced soybean-based fish feed, to Matrix Sea Food India Ltd. (Matrix). The collaboration is expected to greatly expand the aquaculture industry’s access to this attractive alternative to fish meal and other soybean-based diets. Matrix is a manufacturer of aqua feed and feed supplements. With headquarters in India, Matrix exports to several major economies in Southeast Asia, long considered the home of aquaculture, or “fish farming.” As a key part of this industry, Matrix recognizes both the opportunities and the challenges presented by today’s growing market. Global per capita fish consumption has nearly doubled in the last 40 years, hitting a record high in 2016 and continuing to rise an estimated 3% to 4% annually. Aquaculture, rather than wild catch, is driving the seafood industry’s sustainable growth. While the industry is thriving, raising fish in regulated environments such as ocean pens or ponds entails procuring increasingly large quantities of controlled feed. Historically, fisheries have used fish meal, but the primary ingredients—wild fish and shrimp—are rapidly dwindling resources, making the feed expensive and unsustainable. The industry has turned to soybean meal because of its high protein content (around 48%), but that, too, has presented obstacles. Conventional soybean meal, when used at high levels in producing fish feed, contains carbohydrates that fish cannot easily digest. Recognizing a market need, OSC and its research partner, Battelle, developed a process that removes non-digestible carbohydrates and increases crude proteins in the soybean meal. The resulting technology, EnzoMeal®, resolves the issues that to date have limited soybean use as a fish feed protein. EnzoMeal® received a 2017 R&D 100 Gold Special Recognition Award—the highest level of this prestigious award for invention and innovation—in the Corporate Social Responsibility category. Matrix will reach out to its existing client base with product samples, allowing industry to test-drive the advanced feed. In parallel, the company will complete a new facility for large-scale production. V. Siva Prasad, Matrix’s chief executive officer, expects the EnzoMeal® line to grow quickly. “The burgeoning fish farming industry is meeting an important demand, helping to feed the growing global population in a way that is affordable, sustainable, and healthy. That demand has, in turn, created another demand: feeding the fish/shrimp themselves in an equally sustainable way. That’s where EnzoMeal® comes in. OSC will partner with Matrix to help realize its vision for EnzoMeal®, providing technology transfer support, technical assistance, and data for various fish and shrimp species. 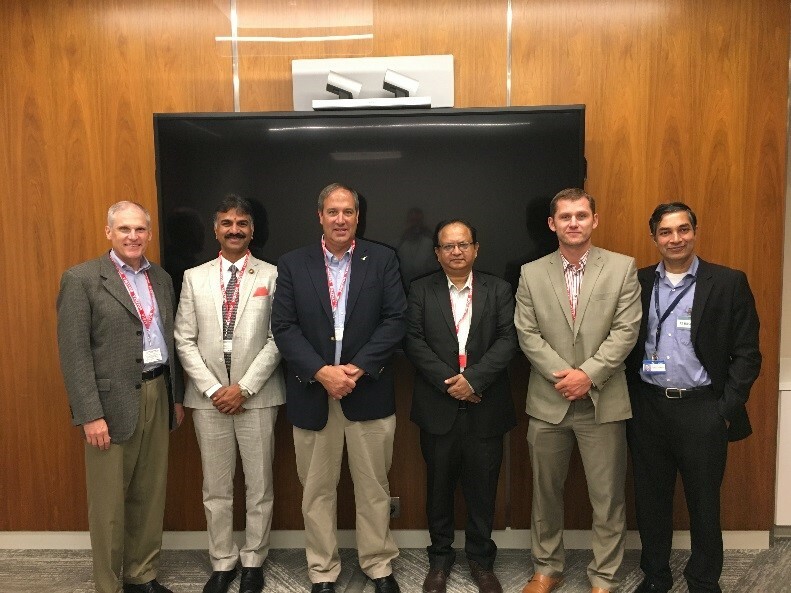 Pictured: The Enzomeal development team (from left): Kirk Merritt (OSC), V. Siva Prasad (Matrix), Steve Reinhard (OSC Board), Shankar Prasad (Godavari Knowledge Society), Barry McGraw (OSC), and Ram Lalgudi (Battelle). not pictured: Rob Cain (Battelle), Mrudula Vempuluru (Matrix), Bhima Vijayendran (Redwood) and Jim Sonnett (Redwood). Food and Agriculture Organization of the United Nations, The State of World Fisheries and Aquaculture, 2016, http://www.fao.org/3/a-i5555e.pdf. RaboResearch, Global Animal Protein Outlook 2018, November 2017, https://www.demolenaar.nl/wp-content/uploads/2017/11/hier.pdf.